Ian Watson, author of the very first novels in the Warhammer 40K universe, makes a long-anticipated return to military SF with “In Golden Armour”, one of three original stories in this fabulous new collection from the man who wrote the screen story to AI: Artificial Intelligence for Stanley Kubrick (later filmed by Steven Spielberg). The 1000 Year Reich boasts eighteen stories that showcase the multiple award-winning author at his best. Brimming with ingenuity and invention, the content varies from fast-paced action to thought-provoking conjecture, from wicked humour to chilling possibility, from the sublime to the outrageous. 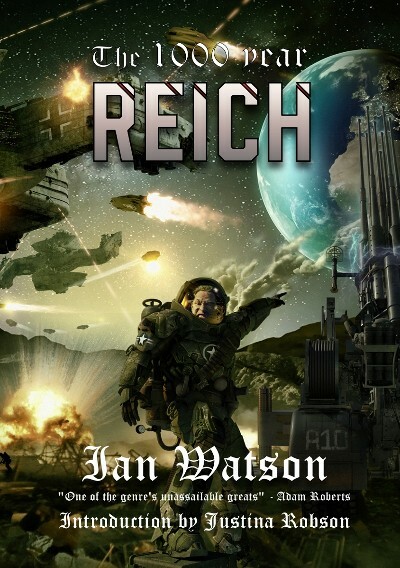 The 1000 Year Reich is available as an A5 paperback and a Signed Limited Edition Hardback, limited to just 100 copies.